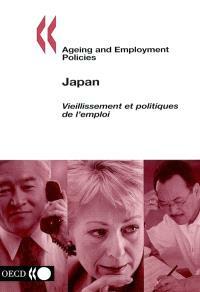 Présentation en anglais Ageing and Employment Policies Japan In the face of rapid population ageing and the trend towards early retirement, there is a need to promote better employment opportunities for older people. Much has been said about the need for reform of old-age pensions and early retirement schemes but this may not be sufficient to raise employment rates for older people significantly or to reduce the future risk of labour shortages. Both governments and firms will need to take measures to adapt wage-setting practices to ageing workforces, to address the extent to which other welfare schemes act as pathways to early retirement, to tackle age discrimination and to improve the job skills and working conditions of older workers. In addition, older workers will need to change their own attitudes towards working longer and acquiring new skills. Little is known about what countries have been doing or should be doing in these areas. This report on Japan is part of a series of around 20 OECD country reports that are intended to fill this gap. Each report contains a survey of the main barriers to employment for older workers, an assessment of the adequacy and effectiveness of existing measures to overcome these barriers and a set of policy recommendations for further action by the public authorities and social partners. This report is based on the proceedings of a seminar and is published in English only. However, a French translation of the Executive Summary and Recommendations has been included in this volume.